What/who inspired you into setting up a record label ? Rob: We set up Lockjaw Records in 2011 just after I’d finished university, when I’d started touring with Darko. We learned that CD sales were dwindling and the music industry was going through a confusing change, so I thought the best thing would be to start selling records! The label was originally owned by the Turner brothers from Tribute to Nothing. In 2011, the old label manager, Syd, wanted to move onto pastures new after taking over from the Turner brothers. Kris from Laughing In The Face Of learned about the opportunity, we riffed about what we could do with it, and that inspired us to take over and re-invigorate the label together (he’s moved on since). 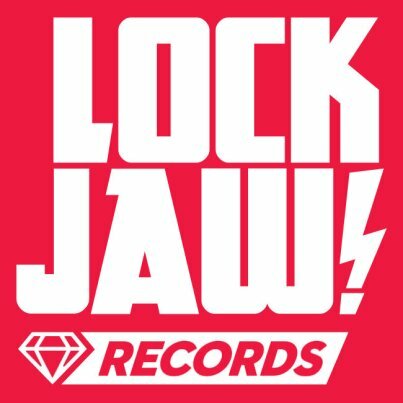 Since then we’ve gone through a number of changes, including a re-brand of Lockjaw in 2018, expanding the team internationally and building a dedicated platform for fast and melodic punk in Europe. I sometimes wonder whether if we would have set up a label, if the opportunity to take over Lockjaw hadn’t been there, but it’s difficult to know. Having a platform to support both my friends’ music and my own music has been pretty awesome, and I’ve gained a lot of experiences and friends from the whole process. What’s been your highlights as a label to date ? Rob: Every release is a highlight, however being part of the Punk Rock Holiday gathering in Slovenia is also a massive fun.Sarah: My highlight is just getting to work with such an awesome team of music-obsessed pals. How have you managed to keep a record label running in an age of easy access digital streaming ? Rob: When I took over Lockjaw, digital was on the rise. The whole industry seemed to be learning as they went. In the DIY punk scene there’s a great community of fans who still will purchase physical products like CD or vinyl as they know there are a lot of collectors, and they’re keen to support the bands directly. I’ve always done other usually music related jobs alongside Lockjaw. Any funny stories you can tell the readers about your label, or the bands you have put out ? Sarah: In 2018, the Lockjaw team expanded from two (label managers Rob and Lesley) to a community of five (myself, Joelle and Cedric). We’re all friends first and we’ve had some seriously fun times together, however, as we’ve found our feet as a team, the thing I’ve found most amusing is the difficulty of simple decisions. We’re usually in agreement about big choices, like which bands to work with, which festivals to attend and how to promote releases… but give us something nice and easy like a t-shirt design and it can spark off a big argument! To celebrate the re-launch of our logo in July, we produced a run of Lockjaw branded merchandise. We thought it’d be fun to give names to the different t-shirts… simple and fun, right? Nope! A hundred tensely-worded group-chat messages, a vote and a stroppy phone call later and we almost managed to make a decision. We normally get on like a house on fire, so I had to laugh at that one! What inspired the name you have given your label ? Rob: This was an easy one, as I took over the label I kept the name and stuck with it. Sarah: Although the label is completely different now, Lockjaw was already a seriously strong name before Rob took it on board. It’s get to be able to keep some of that reputation going! Rob: We have some super cool releases coming up over the next year – some from bands currently on the roster and some from newer bands. Burnt Tapes are dropping their debut full length album after some cracking EPs, and we’ve got some great new singles from math-rockers Wild Tales due soon. Sarah: I’m most excited Wolfrik! We’re releasing their EP ‘Skeleton City’ in lurid pink vinyl and they’re coming all the way from Canada for a full UK / European tour, including Manchester Punk Festival and SBAM Fest. If you’re not heard Wolfrik yet, get ready to have your socks fully knocked off. Rob: I’d love to release an album by Polar Bear Club. They’re such a good band and I want them to release a new record.